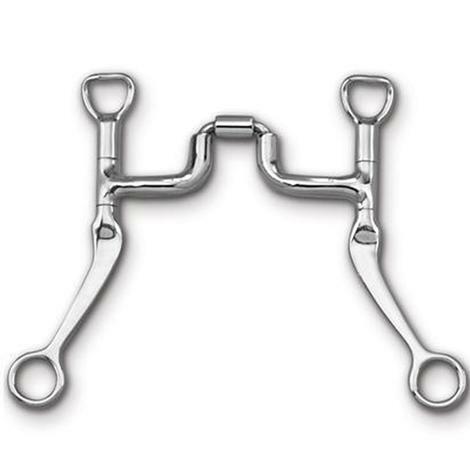 This is a unique bit combination by Myler which combines the features of a shank bit, ring bit, and hackamore to create a cohesive training & riding tool. 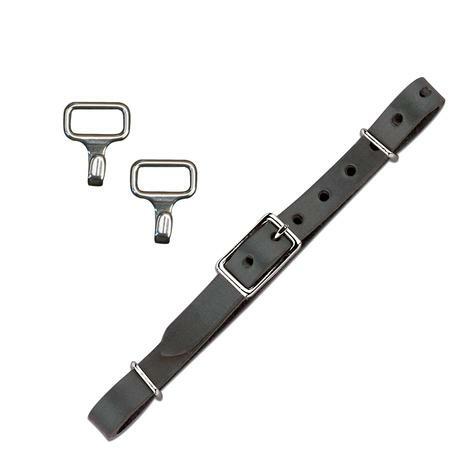 Comes with black leather noseband and curb strap. The MB 36 with 7” Stainless Steel Flat Shank is a Level 2-3 bit, offering significant tongue relief with a degree of tongue pressure. 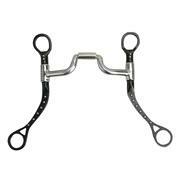 The MB 36 is a solid curved bar that sits across the bars of the horse’s mouth, but has a wide low port that allows the tongue to comfortably pass under the bit. The port is tilted at a 45 degree angle. 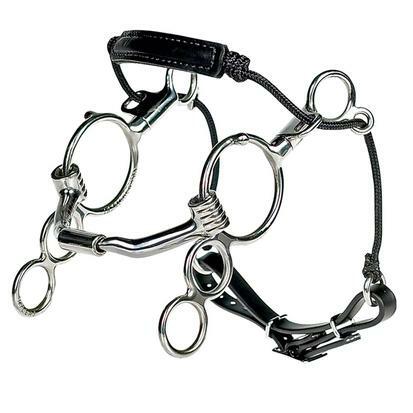 This gives the rider a quicker cue to the horse when reins are engaged. Myler bits unique Independent Side Movement allows the rider to give his or her horse a more precise cue, while having better shoulder control. This mouthpiece is made of polished sweet iron with copper inlay, and will naturally oxidize or rust. This is not harmful to the horse, and its sweet taste promotes salivation. 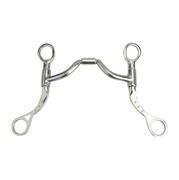 Myler Western MBT Shank 43MB 5"
The MB 43MP with 5 ½” Stainless Steel MBT Shank is a Level 2-3 bit, offering significant tongue relief with a degree of pressure. The MB 43MP is a narrow medium ported barrel that offers a significant amount of tongue relief. Not designed to apply palate pressure. Myler bits unique Independent Side Movement allows the rider to give his or her horse a more precise cue, while having better shoulder control. This mouthpiece is made of polished sweet iron with copper inlay, and will naturally oxidize or rust. This is not harmful to the horse, and its sweet taste promotes salivation. The MB 33 mouthpiece with 5 ½” Stainless Steel MBT Shank is a Level 3 bit, using maximum tongue relief with little to no tongue pressure. The MB 33 is the mildest Myler mouthpiece in terms of tongue pressure. The generously wide port allows room for the tongue to pass under the bit and swallow. Because this mouthpiece does not rotate onto the tongue, it works by applying pressure to the bars, lips, chin and poll. Port is not intended to apply palate pressure. Myler bits unique Independent Side Movement allows the rider to give his or her horse a more precise cue, while having better shoulder control. This mouthpiece is made of polished sweet iron with copper inlay, and will naturally oxidize or rust. This is not harmful to the horse, and its sweet taste promotes salivation. This bit offers a variety of pressure points to take the horse as soft as possible. It uses mostly bar pressure, rolling on the bars. It works very well on horses considered broke or finished. The MB 43LP with 5” Stainless Steel HBT Shank is a Level 2-3 bit, offering significant tongue relief with a degree of tongue pressure. 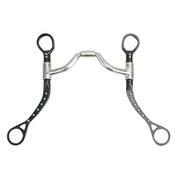 The MB 43LP is a curb mouthpiece that does not rotate onto the tongue, but rather sits solidly across the bars and lips of the horse’s mouth. 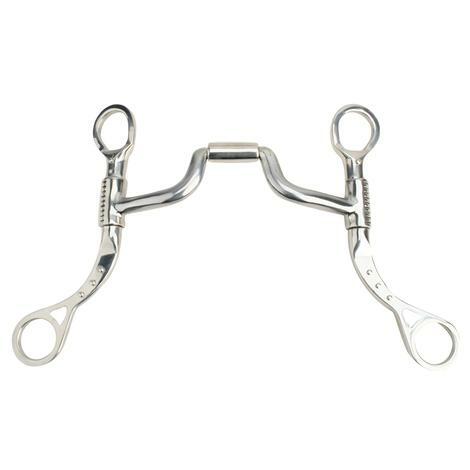 Due to the narrower port, when the reins are engaged, the horse will feel a slight pressure on the outside edges of the tongue, offering a gentle reminder. Not designed to apply palate pressure. 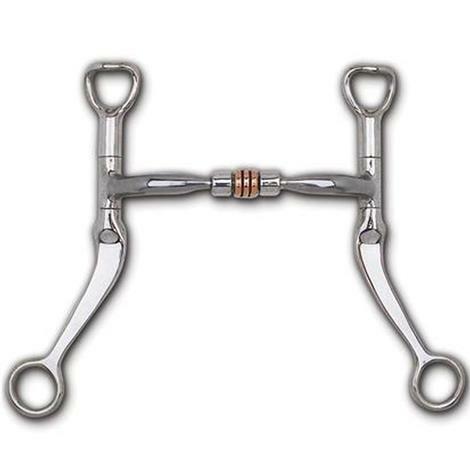 Myler bits unique Independent Side Movement allows the rider to give his or her horse a more precise cue, while having better shoulder control. This mouthpiece is made of polished sweet iron with copper inlay, and will naturally oxidize or rust. This is not harmful to the horse, and its sweet taste promotes salivation. The MB 03 mouthpiece with Stainless Steel Western Dee is a Level 1 bit, applying maximum tongue pressure. 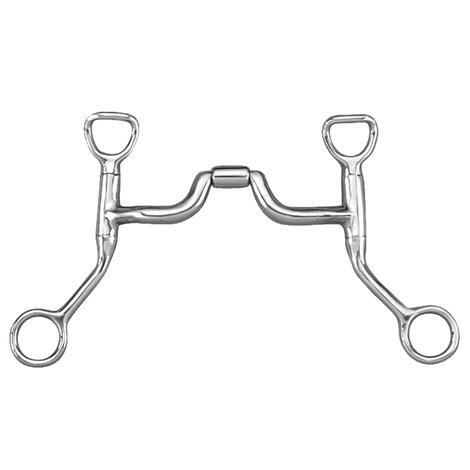 When the reins are engaged, the mouthpiece will rotate fully on the tongue in order to apply the necessary tongue pressure to teach a horse to give to the bit or break at the poll. 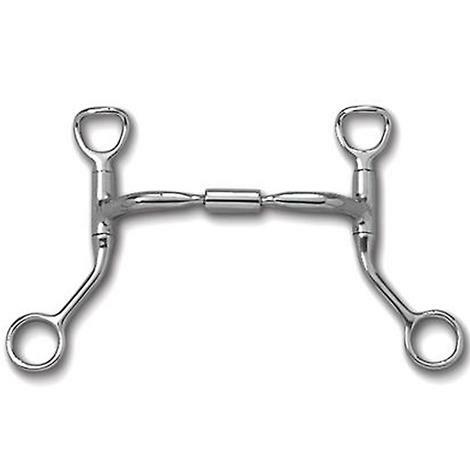 The bars of the bit are curved so the bit wraps the bars and lips of the horse’s mouth instead of pinching them when it rotates on to the tongue. Featuring a copper roller. Myler bits unique Independent Side Movement allows the rider to give his or her horse a more precise cue, while having better shoulder control. This mouthpiece is made of polished sweet iron with copper inlay, and will naturally oxidize or rust. This is not harmful to the horse, and its sweet taste promotes salivation. The MB 41PB with 7” Stainless Steel Flat Shank is a Level 2-3 bit, offering significant tongue relief with a degree of tongue pressure. The MB 41PB is a correctional mouthpiece, meaning it collapses on to the outer lip and bars, and rotates on to the tongue. The port has a tiered design. The base of the port is generously wide with rounded corners, offering close to the same comfort as a Level 3 mouthpiece. The top of the port is narrow and has more pronounced corners. 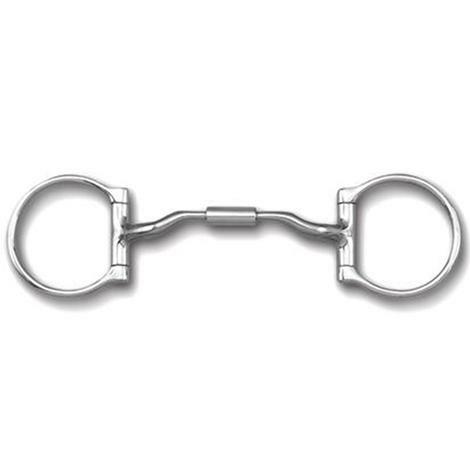 If the horse is relaxed, the tongue can pass comfortably under the wider opening of the bit. 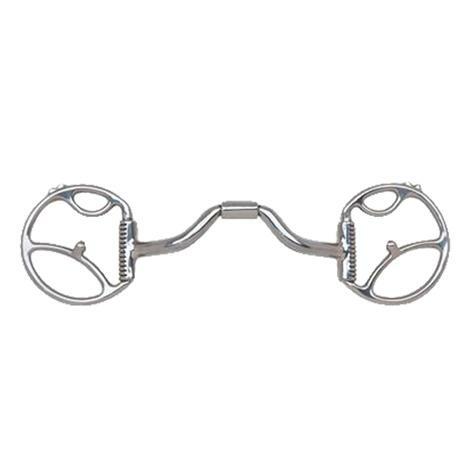 When the reins are engaged, the mouthpiece collapses onto the bars and lips and rotates onto the tongue, applying pressure through the two pronounced points on the upper portion of the port- giving the rider increased control. Myler bits unique Independent Side Movement allows the rider to give his or her horse a more precise cue, while having better shoulder control. This mouthpiece is made of polished sweet iron with copper inlay, and will naturally oxidize or rust. This is not harmful to the horse, and its sweet taste promotes salivation. This mouthpiece is made of polished Sweet Iron which naturally oxidizes or rusts. Harmless to horse, it has a sweet taste and promotes salivation. The MB 33 mouthpiece with Stainless Steel 7” Flat Shank is a Level 3 bit, using maximum tongue relief with little to no tongue pressure. The MB 33 is the mildest Myler mouthpiece in terms of tongue pressure. The generously wide port allows room for the tongue to pass under the bit and swallow. 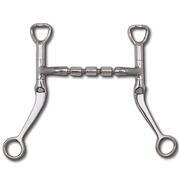 Because this mouthpiece does not rotate onto the tongue, it works by applying pressure to the bars, lips, chin and poll. Port is not intended to apply palate pressure. Myler bits unique Independent Side Movement allows the rider to give his or her horse a more precise cue, while having better shoulder control. This mouthpiece is made of polished sweet iron, and will naturally oxidize or rust. This mouthpiece is made of polished sweet iron with copper inlay, and will naturally oxidize or rust. This is not harmful to the horse, and its sweet taste promotes salivation. 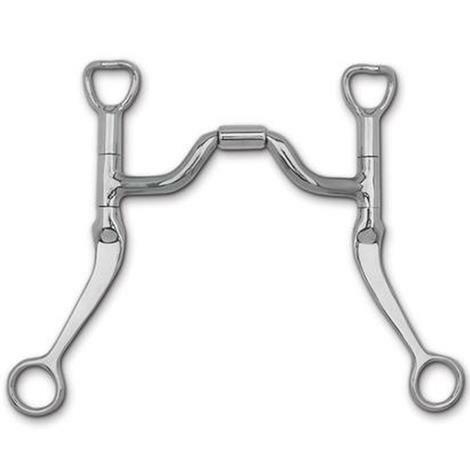 The MB 27PB Correctional with 7” Stainless Steel Flat Shank is a Level 2-3 bit, offering significant tongue relief with a degree of tongue pressure. The MB 27PB is a correctional mouthpiece, meaning it collapses on to the outer lip and bars, and rotates on to the tongue. The port, although narrow and somewhat low, allows room for the tongue to pass under the bit. The pronounced angles on the port provide two concentrated points of pressure on the tongue and very quick control. Not designed to apply palate pressure. Myler bits unique Independent Side Movement allows the rider to give his or her horse a more precise cue, while having better shoulder control. This mouthpiece is made of polished sweet iron with copper inlay, and will naturally oxidize or rust. This is not harmful to the horse, and its sweet taste promotes salivation. The MB 04 mouthpiece with Stainless Steel Western Dee is a Level 2 bit, using some tongue pressure while introducing tongue relief. 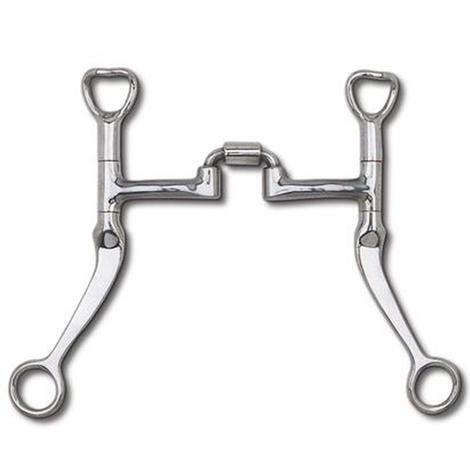 The MB 04 features a ¼” port, applying tongue pressure when the reins are engaged, however the ¼” port allows the horse to swallow when he is moving forward. 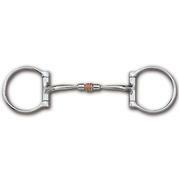 The bars of the bit are curved so the bit wraps the bars and lips of the horse’s mouth instead of pinching them when it rotates on to the tongue. Myler bits unique Independent Side Movement allows the rider to give his or her horse a more precise cue, while having better shoulder control. This mouthpiece is made of polished sweet iron with copper inlay, and will naturally oxidize or rust. This is not harmful to the horse, and its sweet taste promotes salivation.